Resistance was futile, and so we made a date to try out “Burgers & More” which is an independent restaurant below the Kimberly Hotel on Kings Road. We went on a Sunday tea time, and whilst it was fairly busy, we hadn’t booked and they managed to fit us in straight away. The interior is great, it’s below ground but it’s bright and welcoming. There is a good mix of seating and it looked like it would cope with large bookings with ease. The menu is extensive to say the least! 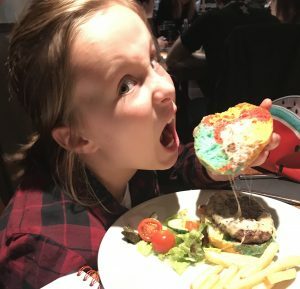 They both chose the monster burgers and were absolutely thrilled with the amazing unicorn bread. The adult menu is where the magic really happens… The donut burger is actually called the “Trump Burger” (Described in the menu as “that daft it might actually work”) There were 22 different burgers on the regular menu plus 4 specials. Not only could you order them individually, you can choose a few of your favourites and get them in a “tower” which is 2, 3, 4 or 5 burgers in a stack. 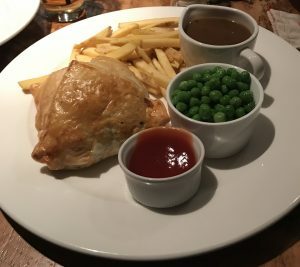 Anyway, back to the Burgers, I chose a special called “Burger Wellington” which was basically beef wellington (garlic mushrooms, pastry and all) but with a burger instead of steak. It was delicious! My husband chose “Jack the Lad” which was a special impregnated with more than a dash of Jack Daniels. He assured me that it was really good although he had wolfed it down before I had the chance to try it myself! 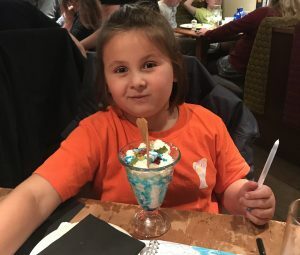 For desert, the kids both chose the sundae which was fantastic value at £2.45 for a massive helping of Vanillis ice-cream with cream, sauce and wafers. I was extremely impressed with Burgers & More. The staff were really friendly and the food was fantastic. 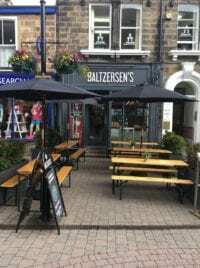 It’s a real gem, an independent family friendly restaurant and I would urge you to get down there to try it for yourself. Note- I wasn’t invited to review Burgers & More, nor did I receive any free food! I just visited with my family and was really impressed. If any of you are interested in the Burgers & More food challenge, you can see the competitive eating legend Adam Moran, “Beard Meats Food” demolishing the 100oz twin burger challenge at Burgers & More here. 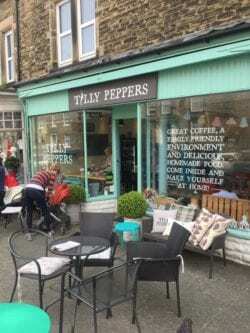 Tilly Peppers on Cold Bath Road is a big favourite with us at Harrogate Mumbler. There isn’t a play area as such – but there’s a big sofa with lots of toys and plenty of books. My daughter happily sits on the sofa reading (you guessed it) a Peppa Pig book whilst hubby and me tucked into some delicious millionaire shortbread! It has a really nice laid-back feel to the place and the staff are super friendly. There is a selection of food available throughout the day from breakfast right through until dinner. 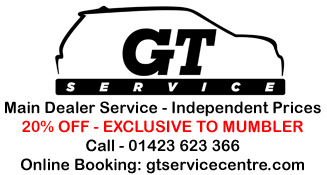 The venue is also available for private hire. A family favourite in the Mumbler household! This American themed restaurant is extremely family friendly and the food is delicious . Children get given a goody bag on arrival with an assortment of crayons, stickers and activities inside. The burgers here are the best in town and if you can’t face a meal out with little ones I can highly recommend ordering from their takeaway menu. What we love about this place is your child can’t escape! There’s plenty for your little one to do and the dining room is in the centre of things, so you can always keep your eyes on them. The breakfast menu and cakes get a big thumb up from me. There’s a lovely feel to this place – a big hit for the grown ups as well as the little ones! Note- this is not a normal cafe- you pay to go in here as it is a soft play/craft/activity club house.